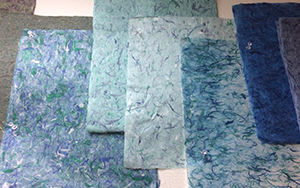 This workshop introduces you to exploring the Japanese method of making paper. The first half of the class is completely dedicated to set up and preparation of all of the fibers. The second half is for sheet forming, pressing, drying and clean up. The main material used will be Kozo. We will then branch out and explore adding in other fibers. We will experiment with the use of dyes and other chemicals used by Japanese papermakers which enables them to produce thin, well formed sheets. You will go home with very individualized papers!